Irrigation business owners inherently have an entrepreneurial mindset. But busy days of making sure everything's running smoothly and handling any issues that may arise doesn’t leave much time to be a visionary. As hard as it may be, it’s important to find the time to evaluate your business - taking a step back and deciding what direction makes most sense for your business. 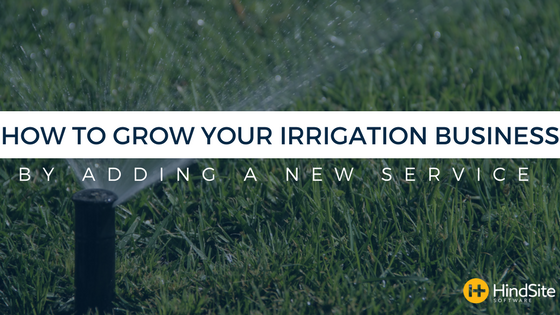 This might mean adding a new service to your operations and there are a few particular options that are easy for irrigation businesses to integrate. Lighting has become a popular trend among the green industry. There are a variety of lighting options you can choose to take on from outdoor decorative lighting, to hanging and taking down holiday lights. It is a great option to provide current customers, and to reel in potential prospects. Another more niche option is rental lighting, where you basically set up lights for outdoor parties such as graduations or weddings. It’s a great option if you do not have vast amounts of spare time. If you’re an irrigation business that only does installations, then backflow testing can really boost a bottom-line. Many states (and even some cities) have specific codes requiring backflow devices to be tested yearly, so it can be a reliable source of revenue. Plus, it gets you out to your customers’ properties more often to offer other services. Snow removal may be the hardest of the three to get into. It requires a lot of investments and time on your part. It can be tough on crews to work the long and cold nights and the weather – and revenue - is not predictable. However, if you do succeed in providing snow removal services, you can make a major money. We have many customers who say the vast majority of their yearly revenue comes from those few months of snow. Still not sold? Here some of the main benefits of adding a services. Added revenue: More money is always a good thing for a business and by adding services, you are more valuable to customers. Variety in jobs: Breaking up a routine with the additional services can keep your crews more involved. They will like the variety in the day and may excel in certain services. Opportunity for techs to grow and specialize their skill set: A new service can provide your employees room to grow in your business. They could become a licensed backflow tester or perhaps learn that they love the schedule of a snow plow driver. Wider range of customers: It’s already been mentioned but by offering more services, you are available to more customers. This allows you to sell not only the additional services you offer, but get them to buy your irrigation services as well. Stronger Customer Relationships: Adding a new service would mean you'll be interacting with customers on a more regular basis. And building a strong relationship with your customers is always a good idea. The more trust you gain, the better and longer the relationship will be. By visiting their property more than once or twice a year, you are nurturing that relationship and showing you care. Adding services is not for everyone and you should not take on a new service unless you are sure your entire business can handle it. But if you are ready, it can be a great way to kickstart growth within your business.